Prepare brownie mix according to box directions and cool. Preheat oven to 400 degrees and place coconut on baking pan. Cook for 2-3 minutes. Stir coconut and cook for another 2-3 minutes until toasted. Watch closely so it doesn't burn. In a large, microwaveable bowl, add unwrapped caramels, salt, and milk and cook on high for 3-5 minutes, stirring occasionally (about every 45-60 seconds). Cook until all caramels are melted and smooth. Add coconut and mix together. Spread over cooled brownies. Refrigerate 4-5 hours or overnight. Remove at least 1 hour from the fridge before cutting. 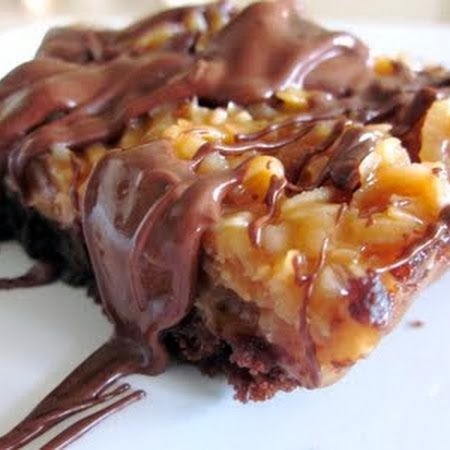 Cut into bars and drizzle with melted semi-sweet chocolate. Let chocolate set and enjoy. store in fridge, but remove 20-30 minutes before serving as the caramel will be hard.